When bacteria or viruses enter the body, proteins on their surfaces are recognized and processed to activate T cells, white blood cells with critical roles in fighting infections. During T-cell activation, a molecular complex known as the microtubule-organizing center (MTOC) moves to a central location on the surface of the T-cell. Microtubules have several important functions, including determining cell shape and cell division. Thus, MTOC repositioning plays a critical role in the immune response initiated by activated T cells. In a recent publication in Scientific Reports, the first authors Lim Wei Ming and Yuma Ito, along with their colleagues at Tokyo Institute of Technology (Tokyo Tech), provide compelling evidence that a key protein responsible for the relocation of the MTOC in activated T cells is a molecule known as CLIP-170, a microtubule-binding protein. The researchers used live-cell imaging to uncover the mechanism of MTOC relocation. “The use of dual-color fluorescence microscopic imaging of live T cells allowed us to visualize and quantify the molecular interactions and dynamics of proteins during MTOC repositioning,” notes Dr. Sakata-Sogawa. This technique allowed them to confirm that phosphorylation of CLIP-170 is involved in movement of the MTOC to the center of the contacted cell surface (Fig. 1); the findings were confirmed using both cells with phosphodeficient CLIP-170 mutant and cells in which AMPK, the molecule that phosphorylates and activates CLIP-170, was impaired. 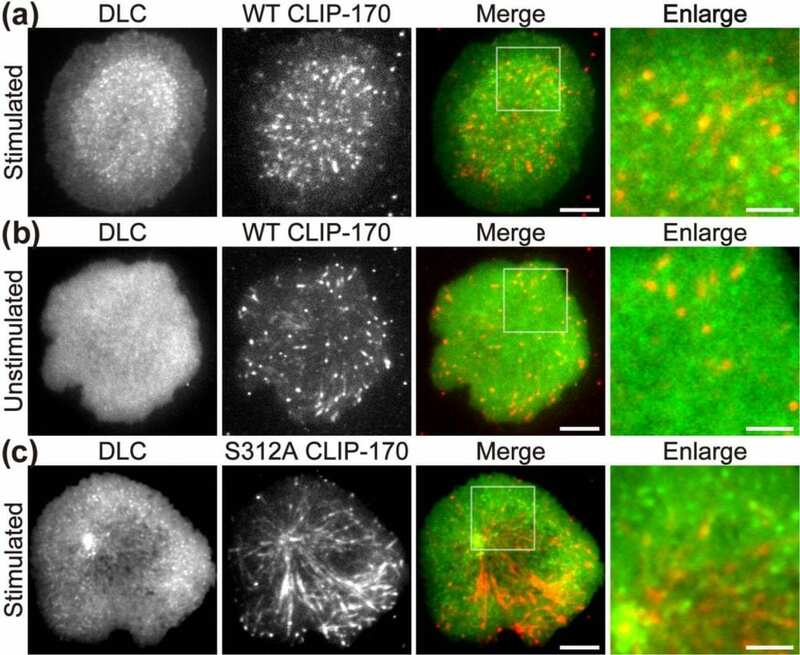 Further imaging showed that CLIP-170 is essential for directing dynein, a motor protein, to the plus ends of microtubules and for anchoring dynein in the center of the cell surface (Fig. 2). Dynein then pulls on the microtubules to reposition the MTOC to its new location in the center. “These findings shed new light on microtubule binding proteins and microtubule dynamics,” explains Dr. Tokunaga. Such research is critical, as a deeper understanding of T cell activation in the immune response, and could lead to the development of safer methods for cancer immunotherapy because presentation of CTLA-4, which is found by a 2018 Novel Prize laureate and used as a target of the therapy, is also regulated by MTOC repositioning.